We are a 15 minute walk from the Porter Square T stop (Red Line). Head southeast on Porter Square toward White Street. Turn right at Summer Street. Bus 85 – Spring Hill – Kendall/M.I.T. Station ;via Summer St. & Union Sq. For more information on taking public transportation to the Agassiz, visit the MBTA Trip Planner. 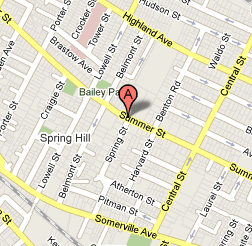 There is street parking for Somerville residents on the side streets near the school. The school driveway is reserved for staff and daily parent helpers.